How do you replace an unsafe elevated highway when no one likes the alternatives? That problem has been plaguing the city of Seattle. In 2001 an earthquake damaged the Alaskan Way Viaduct, a 1.4 mile section of Highway 99 that divides Seattle’s downtown core from its waterfront. What seemed an opportunity to redefine the city’s transportation system and to link two vital neighborhoods that are divided by the viaduct became mired in divisive politics. Conflict led to a public referendum in March 2007, giving Seattle citizens a choice between rebuilding an elevated highway and constructing an underground tunnel. Residents voted “no” to both. Ranked #1 on the Congress for the New Urbanism’s “Freeways Without Futures” list, the Alaskan Way Viaduct is a major regional route into Seattle, carrying about 105,000 vehicles a day. The highway was built on fill, so the underground piles have become a problem, and the seawall that hold up the highway is also deteriorating. After last year’s unproductive referendum, the Seattle City Council called for the Seattle DOT to develop an Urban Mobility Plan – a systems approach, including surface road, transit and other improvements – to replace the highway capacity. Tom Brennan, a native Central New Yorker, is a Portland, Oregon-based transportation consultant, whose firm Nelson/Nygaard, is currently working with the City of Seattle. N/N is developing the Urban Mobility Plan, part of the Center City Seattle Access Strategy – strategic transit service and surface street grid improvements and demand management strategies that together would absorb the current traffic on the viaduct. In early 2008, the governor of Washington State declared that the damaged viaduct will be torn down in 2012, no matter how much or how little has been done to create an alternative solution. 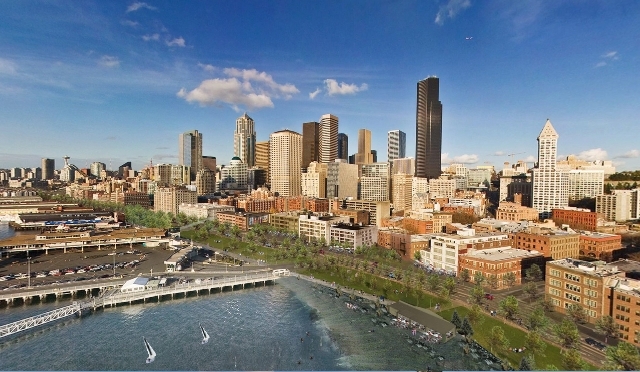 The city, county and state are again looking at the alternatives, agreeing that “the core elements of any solution must address issues such as vigorous public transit, freight mobility, business disruption, urban design, job creation, the preservation of our marine economy and the future of Seattle’s central waterfront” in addition to the fundamental safety, capacity and financial responsibility criteria. In June 2008, the State DOT released eight proposals for a new roadway, including boulevard, elevated viaduct, underground tunnel and cut-and-cover tunnel alternatives. A retrofit of the existing viaduct is not an option. The proposals were presented to stakeholders on September 25. A decision is due at the end of the year. According to the Seattle Times, however, costs could eliminate some plans. The State originally had a $2.8 billion budget, but has spent nearly half of that on work to stabilize the existing viaduct. This entry was posted in I-81, seattle on September 30, 2008 by OCL. Earlier this month Buffalo Niagara Riverkeeper and three other groups filed motions in an earlier lawsuit in US District Court in Buffalo to require the New York State Department of Transportation to modify its construction plan for Route 5 between the Outer Harbor and downtown Buffalo. Riverkeeper and its allies argue that the at-grade boulevard plan will not cost more money in the long run, will improve access to the water, and will free up 77 acres for waterfront use and development, while adding only three minutes to the commute. Riverkeeper is one of many local groups that have been trying to stop the embanked Route 5 in favor of the boulevard in order to increase public access to Lake Erie and take advantage of the lakefront development potential. 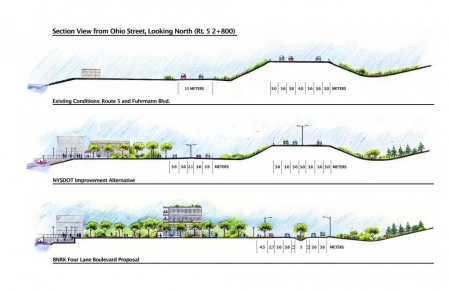 The Congress for the New Urbanism, a national organization promoting highway-to-boulevard alternatives as part of walkable, neighborhood-based development, has also taken an interest in the Buffalo project. CNU’s John Norquist was in Buffalo last week, reiterating the benefits of the boulevard approach. According to the DOT website, its “… Buffalo Outer Harbor Project was developed with the participation and cooperation of many community and civic leaders, civic organizations, community members and professional organizations.” However, the boulevard alternative, which State DOT also concluded to be “feasible” and which is preferred by many civic leaders and members of the community, was not selected. The preferred DOT approach and a variation of the DOT boulevard alternative were evaluated by a traffic engineer for the consulting firm Smart Mobility, Inc., who concluded there were substantially greater development opportunities with the multiway boulevard. The Smart Mobility assessment of the DOT-preferred route found no explanation for the NYSDOT decision to keep the elevated Route 5. Opponents of the embanked Route 5 point out that it needlessly maintains Route 5 as a noisy, high-speed, limited-access highway for just several thousand feet before it meets at-grade traffic lights anyway. The elevated Route 5 limits the number of possible access points to the Outer Harbor and opponents say it compromises the potential for economic development on the Lakefront. In addition, what is at issue is not just the 77 acres and waterfront land in the Outer Harbor area, but also the future of the Skyway Bridge leading to downtown Buffalo. The reconstruction of the elevated Route 5 would seem to guarantee that the elevated Skyway Bridge will stay elevated when it is time to consider its future, in spite of long-range redevelopment plans that would replace it with a street-level crossing. This entry was posted in Buffalo, I-81 on September 30, 2008 by OCL.